Do you and your buddy want to go out together on the lake, but don’t have a way? Are you interested in teaching someone to fish and need a tandem? If so, this article will show you the best tandem fishing kayak and how to choose a kayak. Why Choose a Tandem Fishing Kayak? Some people don’t think best tandem fishing kayaks are good for fishing due to the increased chance of tangled lines and tipping. Despite all that, there are a few really good reasons to choose a tandem fishing kayak over a single person kayak. Teaching: If you want to teach someone how to fish in a kayak, the best way is to show them how to fish in a kayak! Tandem kayaks make that easier by putting you in the same place as your mentee. Conversation: If you are going out with a friend or loved one, then you may want to talk to them while fishing. Tandem kayaks give you that opportunity while allowing you to share each other’s happiness when one of you catches a fish! Experienced Fisher-People: Tandem kayaks tend to be more expensive. That’s why it is best to know you enjoy this sport before investing in one. To do that, we assume you have had a decent amount of experience learning how to fish on a single kayak. Environmentally Friendly: Instead of investing in a fuel-driven boat for 2, the most environmentally friendly thing to do is purchase a tandem fishing kayak. They are also less expensive than boats and gas. Workout: Paddling a tandem kayak can be difficult. Even though you are going to sit and fish all day, you get a bit of a workout by paddling out and back. The video below from some tandem paddling experts gives you some tips and tricks to make it more enjoyable. Access to More Fish: Everyone knows the excitement of paddling to the middle of a body of water to get greater access to fish! Even if you aren’t getting bites on the land, the kayak can take you to where fish are biting in the water. If you are still unsure, check out this article from Austin Kayak. It will give you a better idea of the pros and cons of tandems and singles. What Should You Look for in a Tandem Kayak? There are quite a few factors you should consider when choosing the best tandem fishing kayak for your needs. The following list may seem extensive, but you will be happy you read through it when you get to our top 5 picks! Weight: This refers to both the weight of the kayak and the weight limit of the kayak. Tandems tend to be heavier, so make sure you and your partner can carry it! Also, be sure you, your partner, your gear, and your catches all stay within the weight limit. Tracking: Since tandem fishing kayaks are longer, they need more help tracking than solos. Rudders can really help you take and keep control over your direction. Rod Holders: If you don’t purchase a kayak with rod holders, you will want to install them. Without, you will have a hard time finding a place to keep them since there is another person in the tandem. Comfortable Seats: For all day comfort, you want comfortable seats. If not, you and your partner may have to turn in before you are ready. Aftermarket seats are always an option. Stability: In general, tandem fishing kayaks are more stable than solo fishing kayaks. They are wider and designed to help keep everything balanced in place in choppy waters. Storage Space: Tandem kayaks are somewhat of a paradox: they are big enough for 2 people, but sometimes lack the space to carry everyone’s gear. That’s why it is extremely important to make sure they have enough space for your purposes. If you are strong enough to handle a tandem fishing kayak on your own, you can bring out either pets or children for a fun day on the water! A tandem kayak is a great way to take your pets on the water for a day of splashing and fishing. Look for kayaks with removable seats so pets can lie or sit down. Whatever they want while you paddle. To take children out for a day of fishing, tandems are a perfect craft! They can either help you paddle or relax while you paddle. This is a great way to introduce your kids to the wonderful world of fishing and kayaking. In this article, the adventure junkies introduce new parents to kayaking with their children. If you want your children to learn about kayaking and fishing, you will find this helpful! Those with pets may want to read tips on kayaking with dogs. 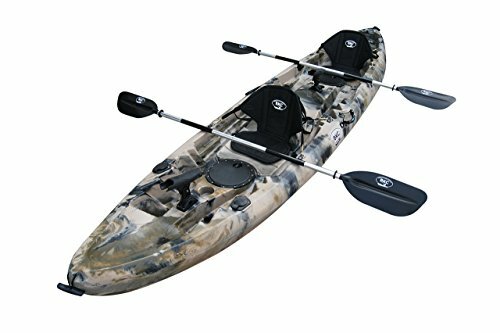 The most comfortable tandem fishing kayak right out of the box is Vibe Kayaks Skipjack. This is a sit-on-top, 12-foot tandem that holds up to 3 people! That means an extremely comfortable amount of space for 2 people. Just keep the 500-pound weight capacity in mind. You will not need to buy aftermarket seats for this craft! The Hero Seats are adjustable into 3 different positions for maximum comfort. However, there are only 2 paddle parks so the 3rd person can’t really paddle. That’s why this tandem is great for 2 adults and a child or pet! For the most comfortable carrying, the Skipjack has 4 handles. It also includes 2 rod holders and 4 mounting points for extras. That means a full 3 people can fish 2 lines at the same time when this kayak is at its fullest. Even for 1 person, the Elkton Outdoors Tandem Kayak is the easiest to use. It is a full 12-foot sit-on-top kayak that includes 2 paddles and carrying handles. The width is a full 3 feet, so it is stable and large enough to hold both people’s gear. You can even stand up and fish! The Elkton Outdoors Tandem Kayak’s body was rotomolded to increase strength and eliminate the chance of cracks. There are also 2 storage areas on both ends and an airtight compartment to keep your stuff dry. For a solo journey, you can mount a seat right in the middle of the kayak. You cannot add a rudder, but you can mount a trolling motor. Even without the rudder, you won’t have an issue with tracking. If you are unsure, Elkton Outdoors offers a 1-year warranty. The Brooklyn Kayak Company’s UH-TK219 is a sit-on-top kayak that fits up to 3 people. It is 12 feet long and has up to a 440-pound weight capacity. There are 4 handles for easy carrying, 2 paddle parks for resting, and 6 rod holders so each person can run 2 lines right out of the box! There are 2 watertight storage compartments so you can keep your important stuff dry. You can even add a crate or box with the bungee tie-downs. Or, simply store large gear back there in the rear storage pouches. This BKC kayak comes with 2 aluminum paddles and 2 deluxe seats. Only 2 people can paddle so the 3rd person can easily be a child or a pet. However, you will need to add a 3rd seat for a child. We recommend purchasing more comfortable aftermarket seats for everyone. 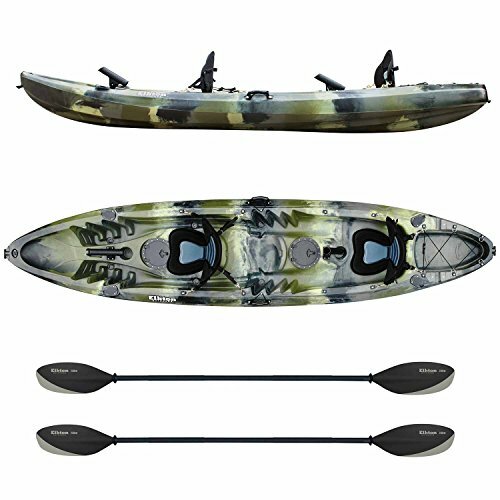 The Lifetime Tandem Fishing Kayak is our editor’s choice for best tandem fishing kayak. This 10-foot kayak is a sit-on-top that fits 2 people up to 500 pounds. 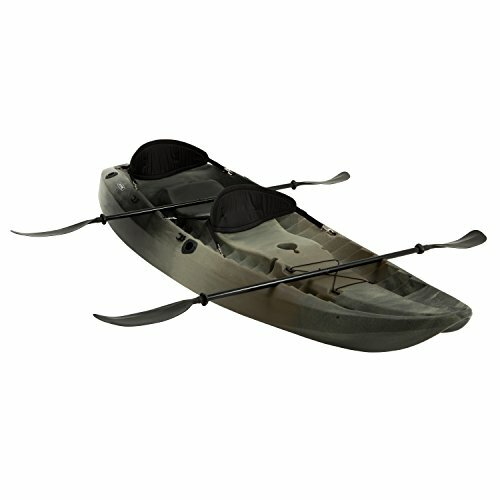 Two paddles are included with this kayak, and there are 2 seat backs included as well. There are also 3 rod holders! 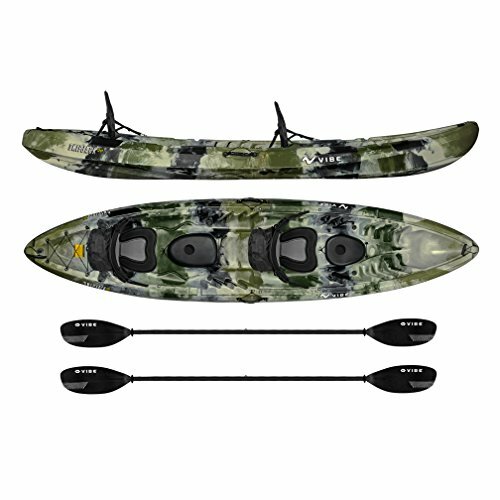 In terms of materials, this tandem fishing kayak is made from high-density polyethylene. Since it is smaller, it is easier to track. However, the smaller size may not be conducive to 2 larger people staying comfortable during a long day. No matter what, it will be a stable ride. If you have older children or pets, this is a perfect fishing kayak. The footrests are also adjustable, so they can fit a wide range of heights. There is no rudder, but you can easily add a trolling motor with a motor mount. 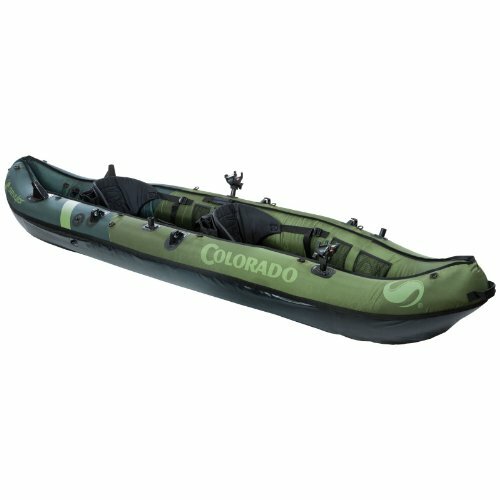 The Sevylor Coleman Colorado is the best value tandem fishing kayak on our top 5 list! Not only that, it is also the only inflatable kayak on the list! This means it is good for those that aren’t as physically strong or are beginners in tandem fishing. The Coleman Colorado is made from 18-gauge PVC construction with a 1000D tarpaulin bottom for strength and stability. The outside of this Sevylor is 840D nylon so it can withstand a normal amount of wear and tear. If it does puncture, there are multiple chambers so you will stay afloat. Included are adjustable rod holders, trolling motor fittings, storage pockets, and paddle holders. This is perfect for a hands-free experience when you want it. The valve is double threaded, so you don’t have to worry about leaks. Included D-rings allow you to attach fishing gear.